Yamaha here has the all new Ray ZR with a much expected disc brake version. The new Ray ZR was first seen at the auto expo earlier this year and it looked promising there. Is it really promising on the road too? Lets find out. 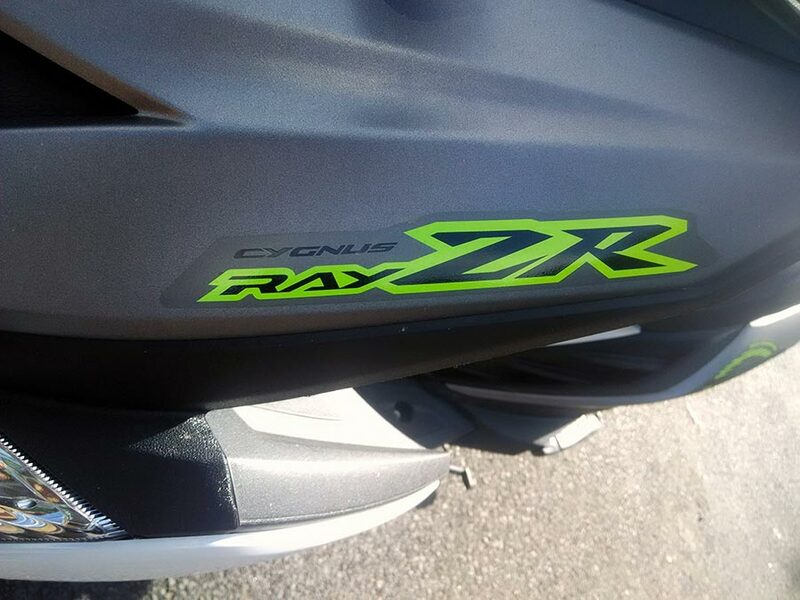 The new Ray ZR has a new design with wide front section and a very aggressive headlight assembly. The headlight is neatly housed in the front section which has cat eyes look to it. The footboard is wide enough for a tall rider to conformably place his legs without moving back on the seat. Since the headlight is not housed on the handle bar cowl, the steering feels light and easy to turn. It has got new funky looking stickers on the body panels which yamaha has come up with to attract boys. 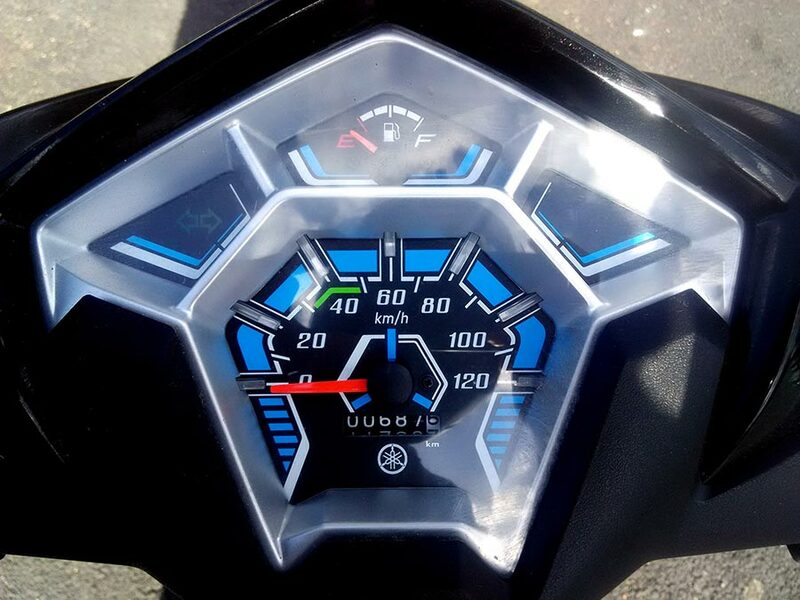 The instrument cluster is a web shaped design with creative lighting to give you a 3D feel at night. The turn indicators are well sculpted into the headlight assembly and look stylish. The Ray ZR has got two intelligently designed front pockets for minimal storage. You can easily keep your phone in one of these if you are a person who doesn’t like to stay away from your phone at all times (even in traffic). The pockets prove handy for small storage. The grab rails are stylish with a rising air design to it. 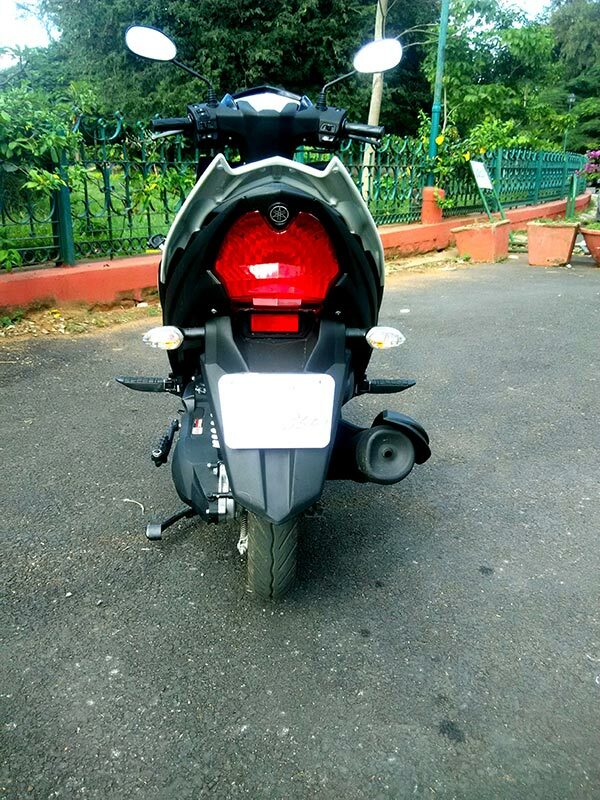 The rear turn indicators on the Ray ZR are not integrated on the tail light but are protruded out of the rear fender which is a first for any scooter in india. 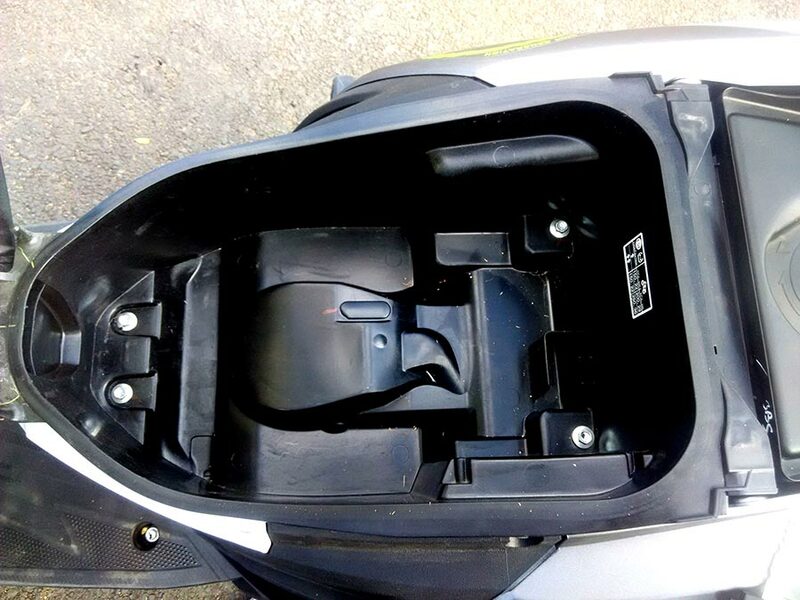 Yamaha Ray ZR has got a 21 litre under seat storage which is spacious enough to store your protective helmet. Yamaha Ray ZR comes with a 170mm disc brake version which is a great addition to a package like this. Yamaha Ray ZR comes with an air cooled, 4 stroke, single cylinder 113cc engine. This engine gives out 7.2 hp of power @7500 rpm and 8.1 Nm of torque @5000 rpm. The engine is not the best at its initial stages. The refinement is seen only after reaching about 25-30 km/hr. Below this speed, there are vibrations which make the footboard shiver. Ray ZR is best to ride between 40-60 km/hr where the vibrations are the least and the engine refinement is noticed. We got a healthy mileage of about 45 kmpl. It is less compared to the company claimed 66 kmpl. We could manage a top speed of 84km/hr and this would excite the speed lovers. The fuel tank has a 5 litre capacity which is quite large. 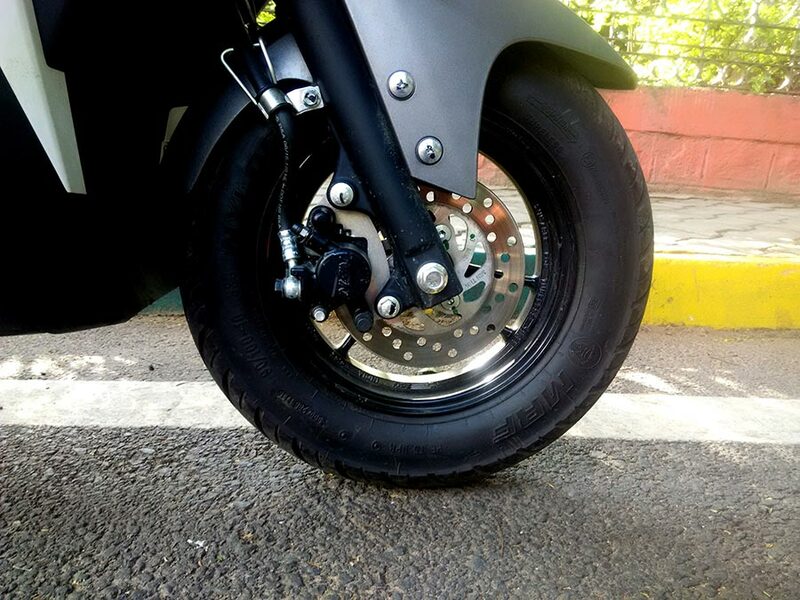 The Ray ZR has a 90/100 section, 10 inch tubeless tyres. The tyres were good on grip and gave us great confidence to ride around in the city. 1270mm wheelbase lets you handle the bike with ease. The telescopic front forks and the unit swing rear suspension weren’t the best but good enough for a comfortable ride. The footboard area is broad enough and the handle turns with ease and tall riders will not have a problem doing the same. The seat height is 775mm and if you are a short rider then you shouldn’t have a problem keeping your foot down. Ray ZR has a good ground clearance of 130 mm and riding on bumps and pot holes is not a problem. With a good set of tyres on offer, cornering at times is not a bad idea at all. Yamaha Ray ZR comes with an optional 170mm disc brake. The disc brake gave us good feedback and we are happy with the way it did it. The wheel doesn’t wobble when you do so and the rear drum brakes included with the front disc seemed like a good deal. The Yamaha Ray ZR has a not so wide seat but its not a problem having them like that. The rider feels comfortable and tall riders will not have any problems for short city rides. Long rides will have you tackle back pains and this is not the best scooter to do that on. 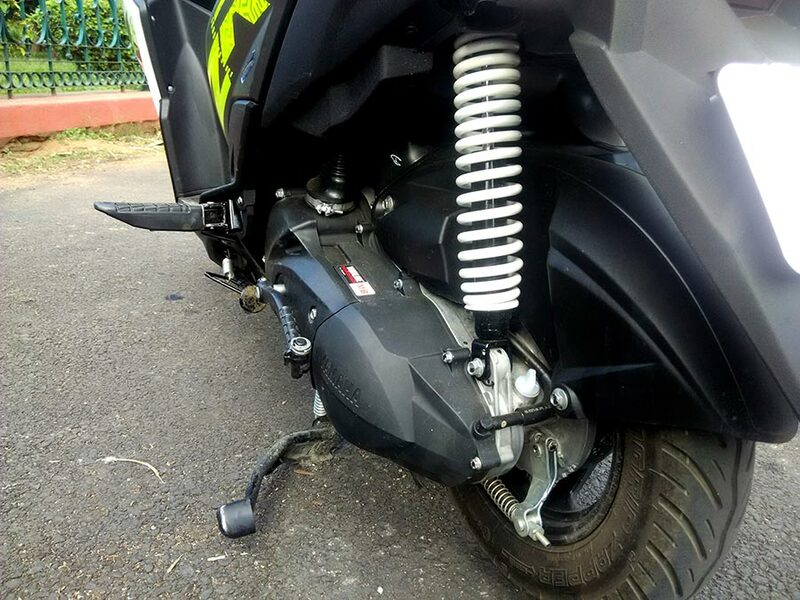 The rear foot pegs are wide enough and the pillion can place their foot easily on it without much problem. The rear end of the seat is comfortable for short people and tall people will find it uncomfortable after a while. Yamaha Ray ZR has set a competition to the contenders in this segment. 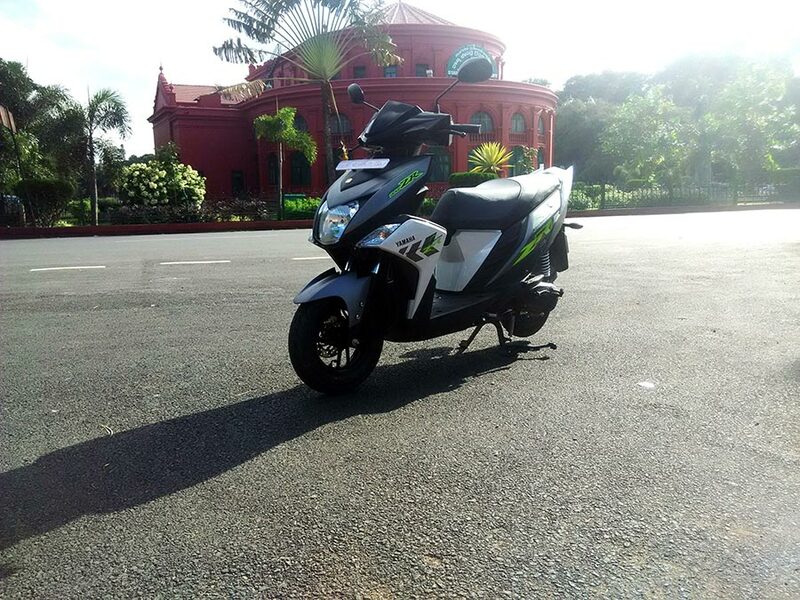 The previous Yamaha Ray was more of a female bike and Yamaha with a sporty approach to its all new Ray ZR aims at getting a good response from the boys as well. 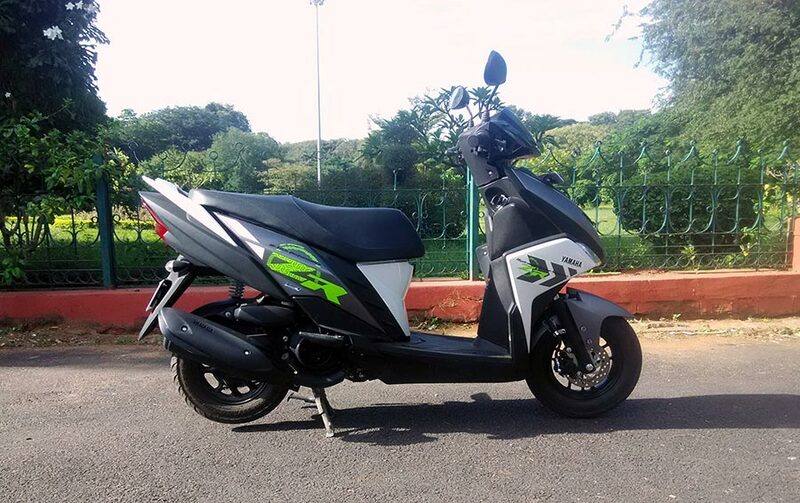 The scooter is a good package when it comes at INR 52,000 (ex-showroom Delhi) with an additional INR 2,500 for the disc brake version. Ray ZR has entered the competition in the small capacity scooters category and yamaha’s reliable quality and engine makes it hard for its contenders. Enjoyed reading this review? Do not forget to share this and follow us on Facebook (GaadiKey), Twitter (GaadiKey) and Youtube (GaadiKey). Also read our other scooter review: New Suzuki Access 125 and Vespa SX 150. Provide your details so that we can arrange Ray ZR for test drive at your city!